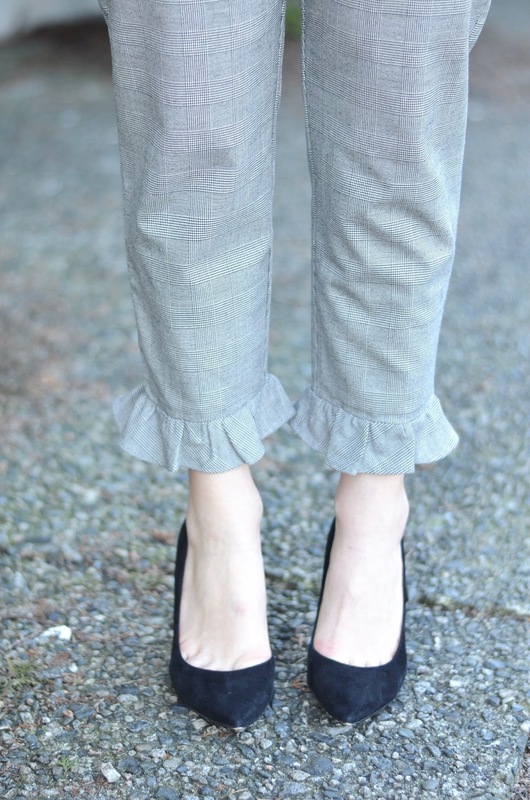 How amazing are these ruffle hem pants?! As soon as I saw them I knew I needed to add them to my closet. They are the perfect mix of trendy/modern and professional. Finding work wear that is trendy but still appropriate for the office is a goal of mine. For today’s look I decided to pair the pants in a more trendy way by wearing a crop top. I wouldn’t wear a crop top to work in a corporate environment, but if you are in a marketing or fashion field (anything that is more relaxed and fashion forward) you could absolutely wear this to work. For me, this look is a new favorite look for blog-related business meetings. These pants don’t have to just be worn in a trendy environment though; they can easily be worn in a more traditional business setting with a crisp white button down shirt. In fact… I think I am going to wear that look for work today! A trendy but still professional work outfit. Have a great Friday everyone and an even better weekend. I’ve got a blog photo shoot on Sunday that I will be sure to do some instagram stories during, so, make sure you are following along on my instagram to get a sneak peek of some of the looks coming to the blog! Beautiful look! love the stripe cropped top and ruffle detail on your pants, you look beautiful! Thank you so much Elise! Hope you're having a great weekend! These are so cute. I love the ruffles! They are so on trend and I love that they are business appropriate! Thank you so much Ruth! I tend to get overexcited when I find things that are business appropriate and still trendy haha. I did a happy dance in H&M when I saw these lol. LOVE those pants! I'm a sucker for ruffles and when they are able to be worn to work it's just amazing to me. Thanks for linking up with Fabulous Friday! I never seen ruffle pants before but I like it! I love the checks with the stripes together. Thank you! These are the first I have seen with the ruffle hem (Ive only seen ruffles at the waist band before) and I just love them so much! Haha you are so sweet! that was a ton of exclamation marks in one paragraph, yassss! <3 Hope you're having a great weekend! This is so adorable, Lee! Love the classic stripes paired with the ruffle-hem pants — just darling! Thank you Sara!! So glad you like it!! Aww thank you Sarah!! Hope you are having a great week!